When it comes to replacing missing teeth or rehabilitating your smile, our Flint family dentist recommends dental implants. Implants are designed to mimic the natural anatomy of a tooth root, allowing them to be set into the jaw in a way that supports permanent restorations such as a porcelain crown, bridge or stabilized dentures. If you have a broken tooth that is not restorable and needs to be removed or you already have missing teeth, implants offer the longest lasting solution to replace them. Dr. Antonela Larashi will thoroughly review your medical history, oral health and anatomy and then determine if you are an ideal candidate for the procedure. 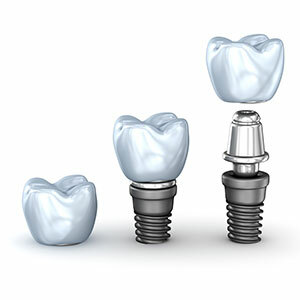 Getting dental implants is generally a multiple-visit procedure that spans the course of 3-6 months to complete. Before starting treatment, Dr. Larashi will walk you through exactly what to expect. This generally includes a brief consultation, treatment planning, the surgical implant of the placement and a period of healing (with a temporary tooth made as necessary) before the permanent restoration is affixed to the integrated implant. Feeling nervous about the idea of having a titanium “root” implanted into your mouth? Dr. Larashi has a dental implant too, so she knows exactly what her patients are experiencing when they opt for this state-of-the-art treatment. Nitrous oxide sedation is available to help you relax throughout the efficient, minimally invasive surgery. Your dental implant might be covered by dental insurance. If not, flexible CareCredit financing is available so that you can start treatment right away. Contact us today to schedule a consultation.